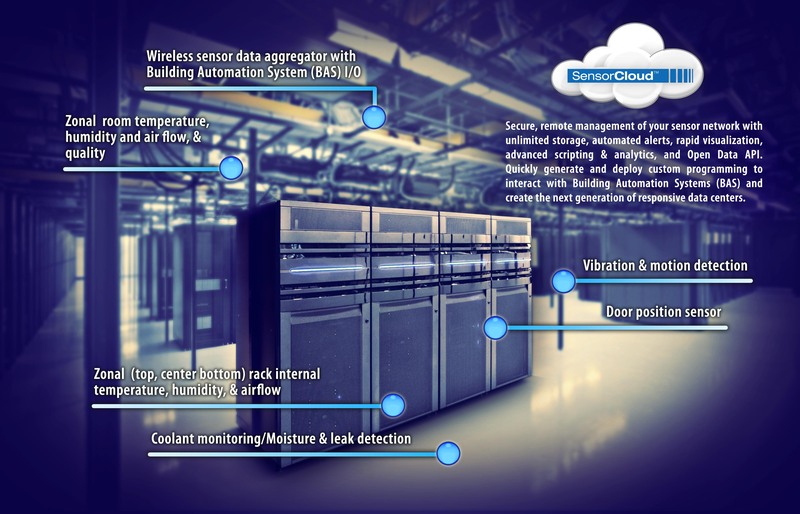 Wireless environmental sensor network provides a scalable monitoring technology for reporting and analyzing distributed data center conditions in real time-for optimized operation and reduced cost. Data centers are designed to operate in a narrow condition range. Deviations from optimal temperature, humidity, and airflow significantly impact HVAC costs and can ultimately undermine operations, maintenance, and useful-life. According to Lawrence Berkeley National Labs, air conditioning for a high density server rack costs up to $17,000 annually, or 50% of total cost of ownership. LORD MicroStrain® wireless sensor networks provide a scalable monitoring technology for reporting distributed data center conditions and optimizing cooling routines for reduce operating costs. LORD’s wireless temperature, humidity, and airflow sensors are easily embedded in or externally deployed on server towers. Low-power communication protocols combined with optional airflow or temperature gradient energy harvesting eliminates battery maintenance for autonomous networks of thousands of wireless sensor nodes across numerous racks, zones, and other points of interest. Combined with SensorCloud™ web-based network monitoring and management, LORD MicroStrain provides a sensing solution that delivers actionable performance information on any web-connected device. SensorCloud remote network management, analytics, and open API allow users to define their key thresholds, and automate real-time condition responses and alerts—from any location. Operators can easily track power-usage effectiveness, assess cooling and ventilation performance, identify hotspots, and program automated systems to respond and report. As a result, it has never been easier to verify maintenance, optimize HVAC, and predict preventative maintenance for cost-effective server ownership.